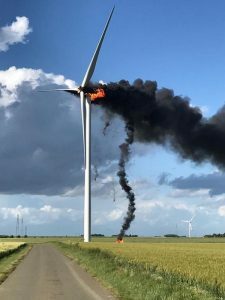 In the first night of June, commune of Marsanne, Drôme, two industrial wind turbines are attacked by fire, the outer nacelle of one of them is entirely consumed by the flames. We used this method, in no way considering that we acted in the best possible way. We want to share it with anyone who wants to take it and reproduce the attack. We dream, not of organization but of individuals acting of their own accord, occasionally associating with sabotage commandos having no other concern than to enjoy fighting dominations unreservedly and inseparably.